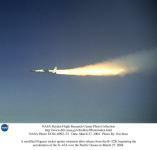 NASA established a multi-year experimental hypersonic ground and flight test program called Hyper-X. The program sought to demonstrate "air-breathing" engine technologies that promise to increase payload capacity or reduce vehicle size for the same payload for future hypersonic aircraft and/or reusable space launch vehicles. Payload capacity was to be increased by discarding the heavy oxygen tanks that rockets must carry and by using a propulsion system that uses the oxygen in the atmosphere as the vehicle flies at many times the speed of sound. Hydrogen will fuel the program's research vehicles, but it requires oxygen from the atmosphere to burn. The X-43 program was originally intended to feature two additional vehicles. As envisioned, the X-43B would demonstrate an engine capable of operating in several modes. The X-43B's combined cycle engine would function as a normal turbojet at low altitudes and switch to scramjet mode at high altitudes and speeds. Planned X-43B flights were to occur sometime in 2009 after the completion of another Hyper-X test vehicle, the X-43C. The X-43C was intended to demonstrate the operation of a solid hydrocarbon-burning scramjet engine at speeds between Mach 5 and 7 sometime in 2008. Both vehicles were cancelled in March 2004 because of a shift in NASA's strategic goals following the announcement of the President's Vision for Space Exploration in January of that year. However, because of the suc-cess of the X-43A , the U.S. Congress added $25 million to the NASA 2005 budget to continue devel-opment of the X-43C research vehicle. Conventional rocket engines are powered by mixing fuel with oxygen, both of which are traditionally carried onboard the aircraft. The Hyper-X vehicles, designated X-43A, carried only their fuel - hydrogen - while the oxygen needed to burn the fuel came from the atmosphere. By eliminating the need to carry oxygen aboard the aircraft, future hypersonic vehicles will have room to carry more payload. Another unique aspect of the X-43A vehicle is that the body of the aircraft itself forms critical elements of the engine, with the forebody acting as the intake for the airflow and the aft section serving as the nozzle. These technologies were to be put to the test during a rigorous flight-research program at NASA Dryden. NASA Dryden had several major roles in Phase I of the Hyper-X program, which was a joint Dryden/NASA Langley Research Center program conducted under NASA's Aeronautics and Space Transportation Technology Enterprise. 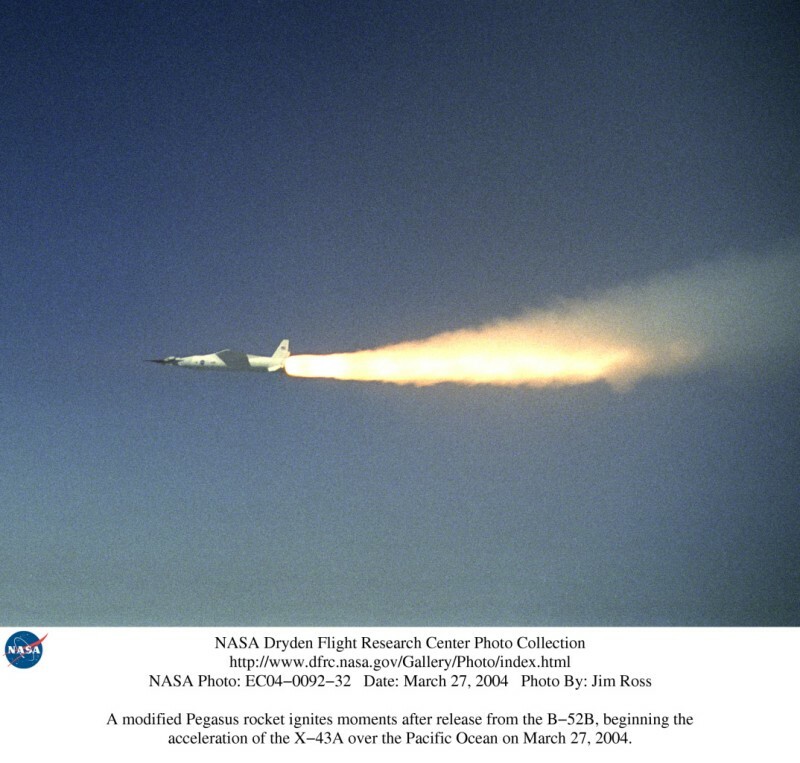 Dryden's primary responsibility was to fly three unpiloted X-43A research vehicles to help prove both the engine technologies, the hypersonic design tools and the hypersonic test facilities developed at Langley. NASA Langley, Hampton, VA, had overall management of the Hyper-X program and led the technology development effort. Through this Langley/Dryden/industry partnership, the Hyper-X program fulfilled a key Agency goal of providing next-generation design tools and experimental aircraft to increase design confidence and cut the design cycle time for aircraft. Fly three unpiloted X-43A vehicles between January 2000 and September 2001. 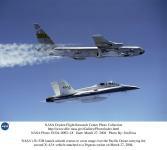 Evaluate the performance of the X-43A research vehicles at Mach 7 and 10. Demonstrate the use of air-breathing engines during flights of the X-43A vehicles. Provide flight research data to validate results of wind tunnel tests, analysis and other aeronautical research tools used to design and gather information about the vehicles. As the lead Center for the flight-research effort, Dryden engineers worked closely with their colleagues from Langley and industry to refine the design of the X-43A vehicles. Dryden also managed the fabrication of both the X-43A vehicles and the expendable booster rockets to serve as launch vehicles. Dryden also performed flight-research planning as well as some vehicle instrumentation and provided control of the tests. Unlike conventional aircraft, the X-43A vehicles does not take off under their own power and climb to test altitude. Instead, NASA Dryden's B-52 aircraft climbed to about 20,000 feet for the first flight and release the launch vehicle. For each flight the booster will accelerate the X-43A research vehicle to the test conditions (Mach 7 or 10) at approximately 100,000 feet, where it separates from the booster and fly under its own power and preprogrammed control. Flights of the X-43A originate from the Dryden/Edwards Air Force Base area, and the missions occur within the Western Sea Range off the coast of California. The flight profile calls for launching the X-43A vehicles heading west. The flight path for the vehicles varies in length and is completely over water. 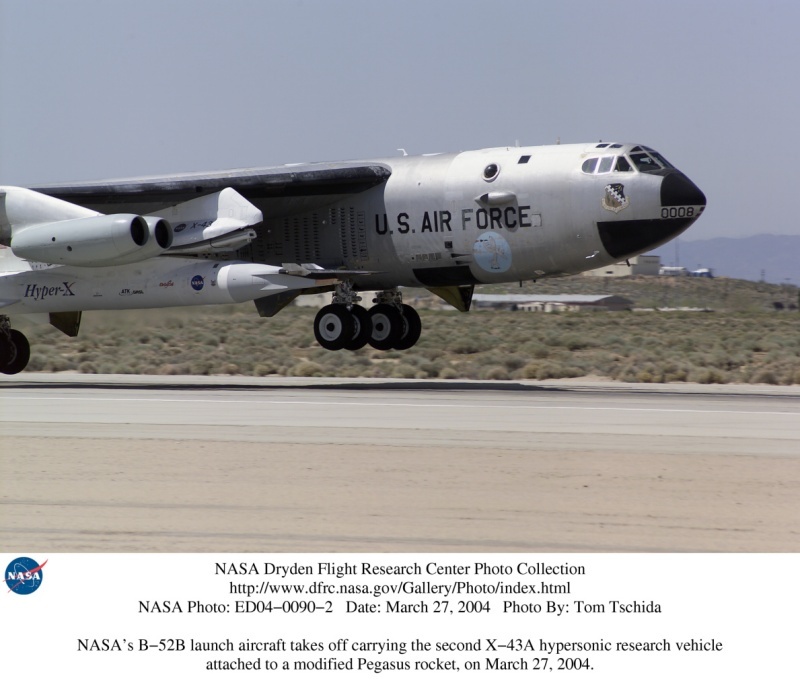 The B-52 Dryden used to carry the X-43A and launch vehicle to test altitude is the oldest B-52 on flying status. The aircraft, on loan from the US Air Force, has been used on some of the most important projects in aerospace history. It is one of two B-52s used to air launch the three X-15 hypersonic aircraft for research flights. It also has been used to drop test the various wingless lifting bodies, which contributed to the development of the Space Shuttle. 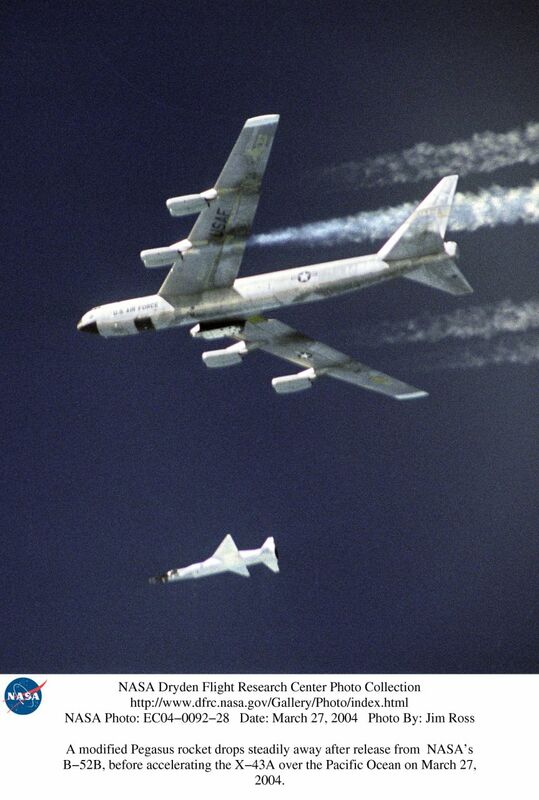 In addition, the B-52 was part of the original flight tests of the Pegasus booster. Modified Pegasus® boosters will serve as the launch vehicles. On 11 August 1998, the first piece of hardware was delivered to NASA - a scramjet engine that was used for a series of ground tests in NASA Langley's 8 Foot High Temperature Tunnel. This engine could later be used for flight if necessary. The first flight engine was to be mated to the X-43 flight vehicle in February 1999 and delivered to NASA Dryden leading to the first flight of the program in early 2000. The next major delivery was to be the X-43A airframe integrated with the second engine and adapter to NASA Dryden in June 1999. The engine was to be transported to Langley for a series of wind tunnel tests in the 8-Foot High-Temperature Tunnel beginning in early 1999 prior to the first scheduled flight in early 2000. 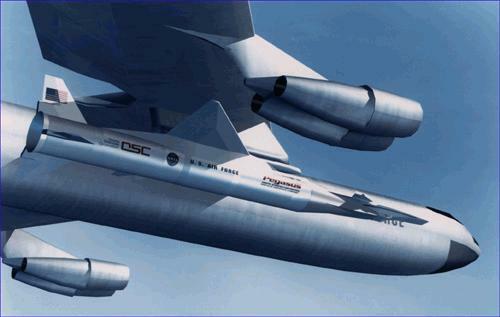 Orbital Sciences Corp., Dulles, VA, was under contract to designing and build three Pegasus-derivative launch vehicles for the series of X-43A vehicles, a process that Dryden oversaw. A successful critical design review for the launch vehicle was held at Orbital¹s Chandler, Ariz., facility in December 1997. NASA selected MicroCraft Inc., Tullahoma, Tenn., in March 1997 to fabricate the unpiloted research aircraft for the flight research missions, two flights at Mach 7 and one at Mach 10 beginning in 2000. Micro-Craft is aided by Boeing, which is responsible for designing the research vehicle, developing flight control laws and providing the thermal protection system; GASL Inc., which is building the scramjet engines and their fuel systems and providing instrumentation for the vehicles; and Accurate Automation, Chatanooga, Tenn. The first X-43A Hyper-X program research vehicle was launched on 02 June 2001. For the launch, the X-43A was attached to the nose of a modified Pegasus launch vehicle, which was carried by NASA's modified B-52 bomber. Seventy-five minutes after takeoff, at an altitude of approximately 24,000 ft., the Pegasus was released. Its solid rocket motor ignited 5.2 seconds later sending the launch vehicle and research vehicle payload on its test flight. Eight seconds later, the vehicle began its planned pitch up maneuver, which was expected to take it to an altitude of approximately 95,000 ft. Shortly thereafter, the X-43A began to experience a control anomaly characterized by a roll oscillation. At 13.5 seconds after release and at an altitude of approximately 22,000 ft., structural overload of the starboard elevon occurred. The severe loss of control caused the X-43A to deviate significantly from its planned trajectory, and as a result, it was destroyed by range safety 48.6 seconds after release. 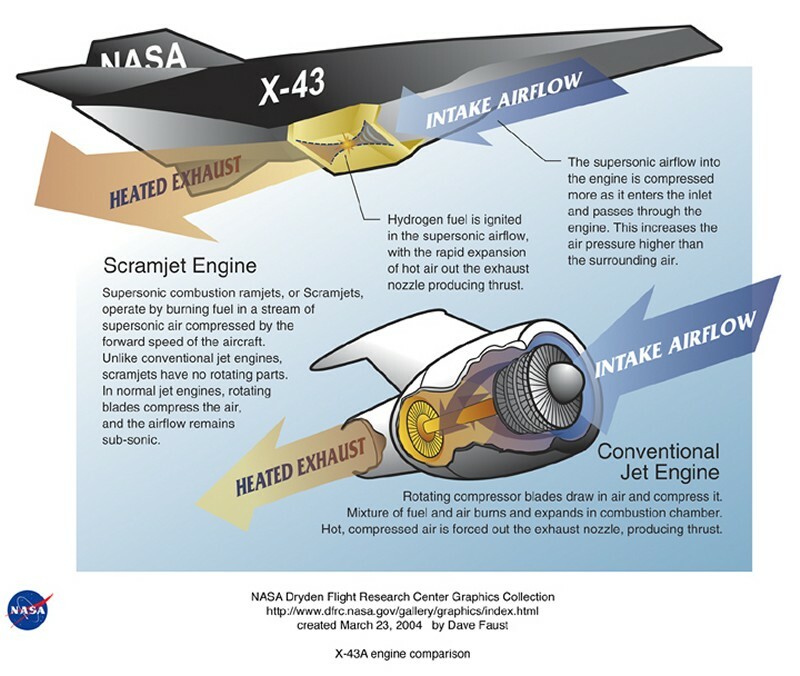 On 23 July 2003 the NASA mishap investigation board charged to review the loss of the X-43A Hyper-X program research vehicle concluded no single factor or potential contributing factor caused the mishap. The flight failed because the vehicle's control system design was deficient in several analytical modeling areas, which overestimated the system's margins. The mishap board found the major contributors to the mishap were modeling inaccuracies in the fin actuation system, modeling inaccuracies in the aerodynamics, and insufficient variations of modeling parameters. The flight mishap could only be reproduced when all of the modeling inaccuracies with uncertainty variations were incorporated in the analysis. The second flight test of an unpiloted 12-foot-long X-43A began on 27 March 2004 when the vehicle was dropped from the wing of a B-52 aircraft, lofted to nearly 100,000 feet by a booster rocket and released over the Pacific Ocean to briefly fly under its own power at seven times the speed of sound (almost 5,000 mph). 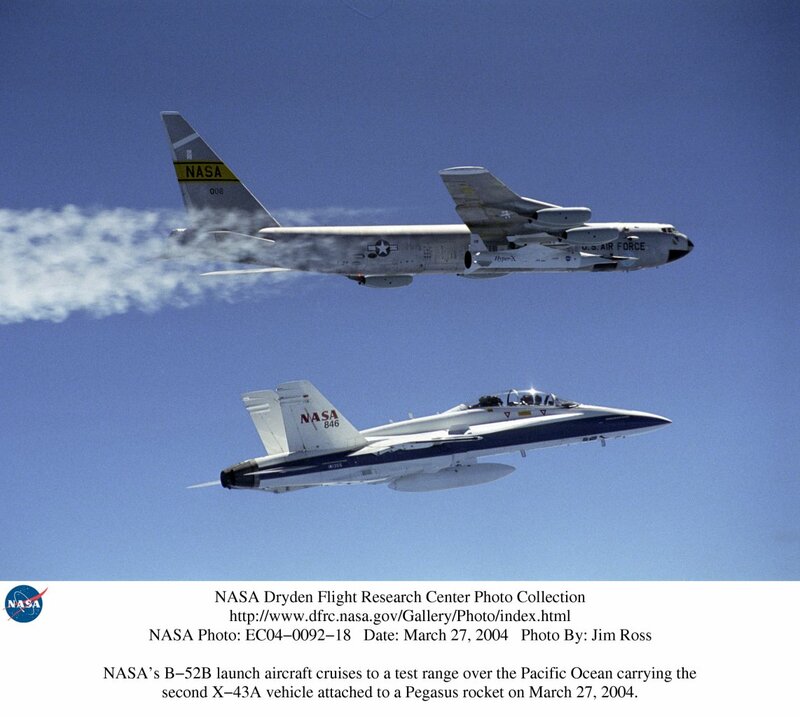 The final flight of NASA's X-43A hypersonic research aircraft took place 16 November 2004. 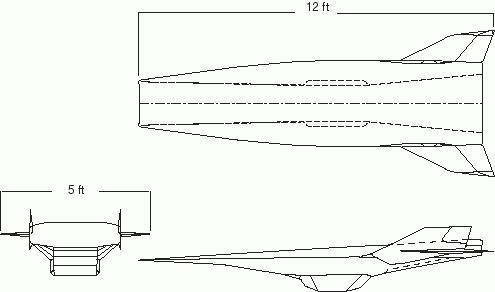 The mission flight-validated the operation of the X-43A's supersonic-combustion ramjet - or scramjet - engine at a record airspeed of almost Mach 10, or 10 times the speed of sound. The X-43A and its modified Pegasus booster rocket was mated to NASA's B-52B launch aircraft on Thursday, Nov. 11. Pre-flight checks of the X-43A and the booster are occurring Friday and Saturday, with final closeouts and fueling slated for Sunday, Nov. 14th. NASA's X-43A scramjet-powered research vehicle broke the air speed record November 16 and showed that an "air-breathing" engine can fly at nearly 10 times the speed of sound. Preliminary data indicate that the revolutionary supersonic combustion ramjet (scramjet) engine worked successfully at about Mach 10 -- more than 11,000 kilometers per hour -- as it flew at an altitude of nearly 34,000 meters. The flight took place in restricted airspace over the Pacific Ocean northwest of Los Angeles. It was the fastest of three unpiloted tests in NASA's Hyper-X Program to explore an alternative to rocket power for space-access vehicles. This challenging ground and flight-research program will expand significantly the boundaries of air-breathing flight by being the first to fly a "scramjet" powered aircraft at hypersonic speeds. Demonstrating the airframe-integrated ramjet/scramjet engine tops the list of program technology goals, followed by development of hypersonic aerodynamics and validation of design tools and test facilities for air-breathing hypersonic vehicles. The scramjet engine is the key enabling technology for this program. Without it, sustained hypersonic flight could prove impossible. Ramjets operate by subsonic combustion of fuel in a stream of air compressed by the forward speed of the aircraft itself, as opposed to a normal jet engine, in which the compressor section (the compressor blades) compresses the air. Unlike jet engines, ramjets have no rotating parts. Ramjets operate from about Mach 2 to Mach 5. Scramjets (supersonic-combustion ramjets) are ramjet engines in which the airflow through the whole engine remains supersonic. Scramjet technology is challenging because only limited testing can be performed in ground facilities. Long duration, full-scale testing requires flight research. Hyper-X will help build knowledge, confidence and a technology bridge to very high Mach number flight. Currently, the world's fastest air-breathing aircraft, the SR-71, cruises slightly faster than Mach 3. The highest speed attained by NASA's rocket-powered X-15 was Mach 6.7. The X-43A aircraft is designed to fly faster than any previous air-breathing aircraft. The air-breathing, hypersonic X-43B - the third and largest of NASA's Hyper-X series flight demonstrators - could fly later this decade. NASA will develop, test and fly the Hyper-X series over the next two decades to support development of future-generation reusable launch vehicles and improved access to space. The Turbine-Based Combined Cycle (TBCC) engine project seeks to deliver a Mach 4+ hypersonic propulsion system in this decade. Prime among its enabling technologies: the Revolutionary Turbine Accelerator (RTA), intended to demonstrate high mach turbine performance and durability for space access. The Next Generation Launch Technology program tasked NASA's Glenn Research Center to lead high-Mach turbine propulsion development projects, including the TBCC/RTA effort. Glenn Research Center has formulated the Revolutionary Turbine Accelerator project to develop and demonstrate TBCC-based propulsion for space access. Project participants include industry, academia, the U.S. Department of Defense and several NASA centers. The state-of-the-art in high Mach turbine engine technology is the J-58. The RTA project seeks to advance the state-of-the-art in high Mach turbines to 25% increase in Mach number, 250% higher Thrust/Weight, and 2 times improved component life by 2010. By 2015 the RTA project seeks to advance high Mach turbines to 35% increase in Mach number, 375% higher T/W, and 4 times improved critical component life. In order to further these advancements the project is initially pursuing a mid-scale ground demonstration testbed. The RTA project consists of the development and test of a mid-scale ground-based turbine accelerator demonstrator and a possible sub-scale turbine accelerator flight demonstrator with Dual Mode Scram Jet (DMSJ) for a X43-B test flight vehicle. The mid-scale RTA Ground Test Engine (GTE) would evaluate & demonstrate Mach 4+ turbo machinery and the advanced technologies required to reach Mach 4. The RTA GTE would be approximately 50-60% of projected full-scale and will be flight-like. Flight-like means that all the ancillary components, for example a fuel heat exchanger, will be incorporated into the demonstrator. In other words, there will be no external components. However, the GTE will not be flight-weight. NASA GRC, in Cleveland, OH, led the Revolutionary Turbine Accelerator Project (RTA), and selected GE Aircraft Engines (GEAE), headquartered in Evendale, OH for a 5-year mid-scale project to begin immediately. Geae is wokring with NASA GRC to develop the RTA for a new Mach 4+ engine. GEAE worked to develop an augmentor/ramburner - a key feature for the TBCC engine. This construct will serve as a conventional augmentor boosting the turbine engine thrust nearly 50% during its transition to supersonic flight. The augmentor will transition to a ramburner between Mach 2 and 3 which will then accelerate the vehicle to speeds above Mach 4. The air-breathing, hypersonic X-43C, is part of NASA's Hyper-X series of flight demonstrators. Now in development, the X-43C is expected to accelerate to a maximum potential speed of about 5,000 mph, and could undergo flight-testing as early as 2008. NASA will develop, test and fly the Hyper-X series over the next two decades to support development of future-generation reusable launch vehicles and improved access to space. On 08 October 2003 NASA selected Allied Aerospace Industries of Tullahoma, Tenn., to provide three flight-ready demonstrator vehicles that will fly approximately 5,000 miles per hour or seven times the speed of sound. The multi-year project, called X-43C, will expand the hypersonic flight envelope for air-breathing engines. The cost-plus-fixed-fee completion type contract carried performance incentives and was valued at nearly $150 million over 66 months. The base activity covers all work through completion of the Preliminary Design Review, and the optional effort covers the final design, hardware fabrication and all associated support activities. The X-43C is the next logical step, following the current Hyper-X (X-43A) vehicle that aims at demonstrating short duration scramjet powered flight at Mach 7 and Mach 10. 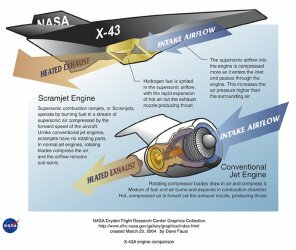 The X-43C will demonstrate free flight of a scramjet-powered vehicle with acceleration capability from Mach 5 to Mach 7, as well as operation of a hydrocarbon fuel-cooled scramjet. NASA's Langley Research Center, Hampton, Va., is leading a combined U.S. Air Force/industry team in the design and development of the X-43C demonstrator vehicle and its propulsion system. The engine, which will be provided by the Air Force, will be a dual-mode scramjet capable of running as a ramjet or scramjet. Allied Aerospace, Flight Systems Division, will team with Pratt & Whitney, West Palm Beach, Fla.; Boeing Phantom Works, Huntington Beach, Calif.; and RJK Technologies, Blacksburg, Va. Work will be performed primarily in Tullahoma and West Palm Beach, although some contract work will also take place at Huntington Beach, Blacksburg and St. Louis, Mo., and at Langley and NASA's Dryden Flight Research Center, Edwards, Calif.
Future air-breathing space access vehicles offer advantages over conventional rocket-powered vehicles that must carry all of the oxidizer needed to burn their fuel. Air-breathing engine-powered vehicles obtain oxygen from the atmosphere in flight. By minimizing the need to carry oxidizer, smaller and more efficient vehicles can be designed for space access missions. When fully developed, these advanced propulsion systems will offer increased safety, payload capacity and economy of operation for future, reusable space access vehicles. The X-43C project will validate advanced technologies, design tools and test techniques that will enable design of such vehicles in the future. For the three demonstration flights, a Pegasus-derived rocket booster will be air-launched by a carrier aircraft to boost the X-43C demonstrator vehicles to Mach 5 at approximately 80,000 feet. The X-43C will separate from the booster and continue to accelerate to Mach 7 under its own power and autonomous control. 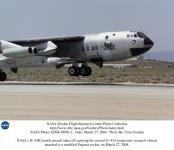 Flights will originate from Dryden/Edwards Air Force Base, Calif. Flight paths of the vehicles will be over water within the Pacific Test Range.